Strahan, surrounded by Tasmania’s Western Wilderness, is a town with loads of pioneering heritage and our journey from the north-west of Tasmania to the west coast was one filled with some awe-inspiring sights. 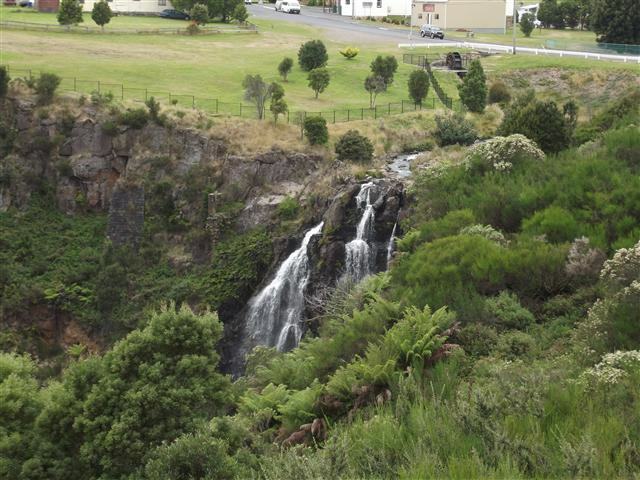 Some of the Tasmanian west coast’s most beautiful country can be seen down the Murchison Highway towards Queenstown. There was very little traffic as we set off along this stretch of road and we had a smooth if somewhat slow run. The roads here tend to be narrow, single-laned, and very winding. Not that that was a problem when there was such beautiful countryside to look at. It was when we were passing through the little town of Yolla that something caught my eye and this definitely needed to be photographed. It was the Krackatinni Tavern! After our brief stop there we drove through some fantastic forests where the trees lined the highway on both sides forming an arch or canopy over the road. John was concentrating on the driving and after a couple of hours he needed a break and I could almost smell the coffee so we stopped at Hellyer Gorge Rest Area in what seemed to be a very popular place. The small parking lot was jam-packed with various motorhomes and vehicles, including a bunch of guys on motorbikes, and every available picnic table was occupied so we stood at the back of the car and drank our coffee. Later we took a slight detour off the highway to visit the little town of Waratah where we stopped in the park for lunch. What a charming little town! 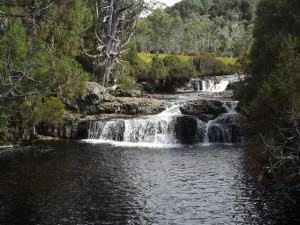 There is a waterfall that is gorgeous and we had a chat with some of the ladies at the Waratah Roadhouse and they showed us a photograph of the waterfall in winter, frozen solid! The town began in 1873 following the discovery two years earlier of tin at Mount Bischoff and this was the birth of Tasmanian mining. The mine closed in 1947 and today the town’s population has dwindled to only a few hundred. 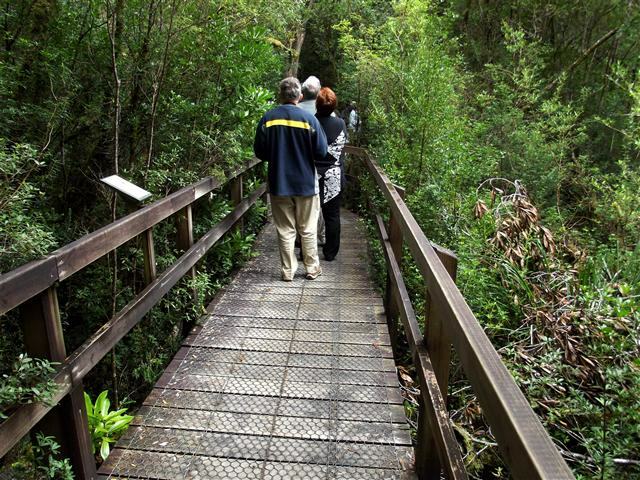 Situated on the edge of the Tarkine, Waratah was the site of perhaps the first air-land rescue in Tasmania when in 1937 two Hawker Demon fighters from Laverton Air Force Base went off course and crashed landed. The propeller from one of the planes is mounted in the foyer of Waratah’s Bischoff Hotel. Cradle Mountain View Lookout. We walked up that steep hill against a freezing wind and when we got to the top we couldn’t see anything, low cloud had obscured the whole view except for Lake Lea. So we carried on to the National Park and spent a little time photographing the view but the weather had become even more unpleasant and we didn’t go on to the mountain. Disappointing but we still had 132kms to go to Strahan and it was better that we got going. We passed through more forests and the little town of Tullah before we turned off towards Zeehan, crossed the magnificent Lake Rosebery and passed Mt Murchison. did; the rain started again and before long it was bucketing down! 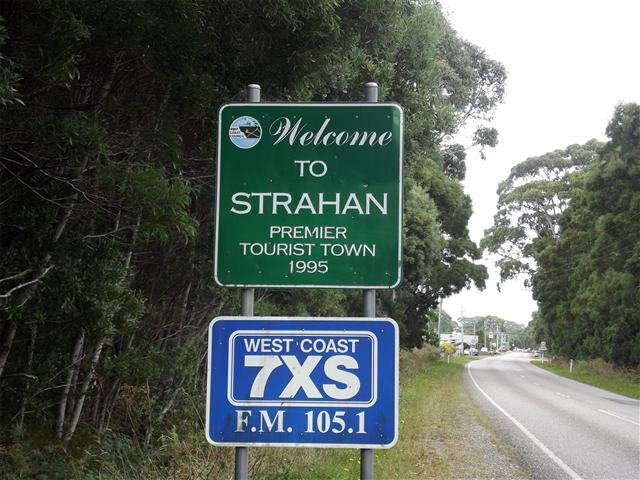 Strahan is a quaint little village on Tasmania’s west coast. 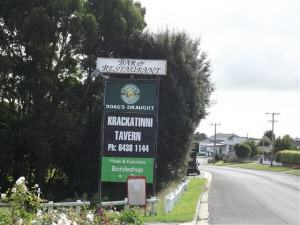 It was originally developed as a port for the local timber industry around Macquarie Harbour but these days tourism is its primary industry and in that regard Strahan has a lot to offer. For our first morning here we wandered over to Regatta Point where the West Coast Wilderness Railway trip leaves. The train had left some 45 minutes before and as the train runs only once each day we were disappointed that we would miss out this trip. But we went into the railway office anyway and had a chat with the lady there, picking up a lot of information about the train, before stopping at the visitor information centre. John was asking about fishing spots but I was more interested in the cruises. We wandered off to the Heritage Cruisesoffice for a brochure and then over to Gordon River cruises for another brochure and over coffee we decided to go with Gordon River Cruises. THE place for fishing info! After booking our tickets for the next day we stopped at The Shack which is apparently THE place for all you need to know about fishing in Strahan. One of the things they told us was not to use bait. Apparently that would only feed the crabs. They told us to use lures, shiny silver lures. And so, that afternoon we set off for Macquarie Heads and a hopefully productive afternoon of fishing. Getting there is half the fun? 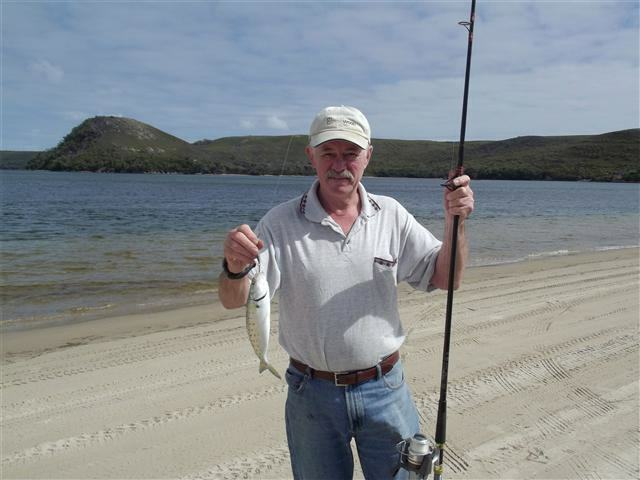 Macquarie Heads is where the Macquarie Harbour meets the Southern Ocean and is, according to the experts, the best place for beach fishing. Well, it might have been only 13 kilometres (8 miles) from the centre of town but with the road mostly unsealed, it took us well over 20 minutes to get there and it seemed that quite a few other people thought that this was the best place for fishing as well. 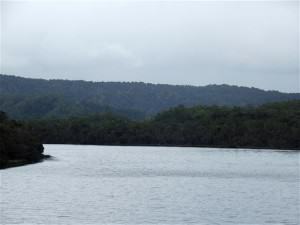 The water in Macquarie Harbour is a unique mix of freshwater with a saltwater layer underneath. About the only fish species that thrive in these conditions are trout and salmon. We found a spot on the beach, chatted to a few guys there to see what they were catching, and that wasn’t much, and settled down to see if we could do any better. It wasn’t long before things started jumping, and I’m not talking about the fish. From 4×4 vehicles to quad bikes and families with lots of kids, jet skis and cruise boats, that beach was busier than Sydney’s CBD! With all that noise any self-respecting fish would have taken the day off! We didn’t hold out much hope of catching anything then so I was more than surprised when John said he had a bite! I thought it was probably one of the jet skis and said as much to John but he pulled in a nice little Australian salmon. Well well, it looked like we were going to get that elusive fish dinner. We just needed one or two more. It wasn’t long before another one went after the lure and dinner was assured. But that was definitely the end of things. After that John didn’t get so much as a nibble but he was determined to stay as long as he could, well, at least until I reminded him about the distinct lack of a ladies room out there. By then the wind had come up as well and it became quite cold so we packed it in and headed back to camp. We were up early the next morning for our cruise with Gordon River Cruises looking forward to a full day on the water. And what a good day it was. Pity about the weather, though. We had to be at the wharf at 8:00 for our cruise and it was not long after that time that we boarded the Lady Jane Franklin II. 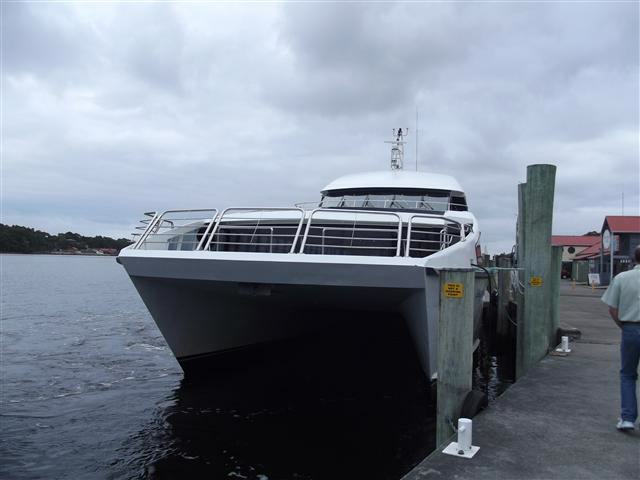 The Lady Jane Franklin II can carry 212 passengers, is 32 metres (105 feet) long, and 9.5 metres (31 feet) wide, is a twin screw vessel with a 1.6 metre (5-foot) draft, and can do 32 knots. John tells me that this all means something but it went right over my head. We were welcomed aboard by our captain, Graham, and the crew, Stacy, Irene, Janet, and Michael and the boat set sail, so to speak, just after 8:30 for Hell’s Gate at the mouth of the Macquarie Harbour. 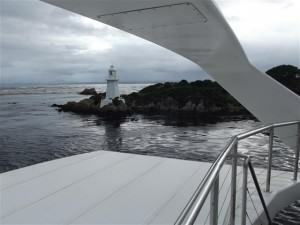 The weather was not being kind at all; it was overcast with occasional heavy showers, and cold and windy as we passed the lighthouse and entered the largest ocean in the world from the second largest harbour in Australia. Macquarie Harbour is second in size only to Port Phillip Bay in Victoria and six times the size of Sydney Harbour. A lonely lighthouse guards the entrance to the harbour which is notoriously shallow and dangerous. The name “Hell’s Gates” comes from the convict era when convicts were sent to the Macquarie Harbour Penal Station on Sarah Island. As they entered the harbour they often referred to it as the “entrance to Hell”. Between 1900 and 1902 a breakwater was built and the channel was dredged. Remnants of the original breakwater can still be seen. Our captain made comment about the number of boats and lives lost here and then said he’d always wondered about the Lady Jane Franklin I! The water was pretty rough and we rocked and rolled with it and were all pretty much relieved when we soon returned to the harbour. rivers, the Collingwood and the Franklin merging into one. This one, the Gordon River, flows into Macquarie Harbour. One outstanding feature of the water here is that it is brown, caused by the buttongrass that grows along the banks. Buttongrass has tannin in its roots and the tannin leaches into the water, staining it the colour of tea. It is still safe to drink even if the colour is a little off-putting. We stopped briefly at Heritage Landing where we were able to go for a walk through the rainforest. One of our guides gave a talk about theforest, telling us that this is the largest tract of temperate rainforest still remaining on Earth and, of course, we learned about the Huon pine, a conifer native to the south-western corner of Tasmania. The Huon pine is a long-lived tree and a stand of the trees, estimated to be approximately 10,500 years old, was recently discovered on Mount Read in Western Tasmania. 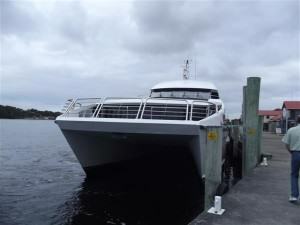 Heritage Landing is as far as the cruise boat can go in order to protect the delicate eco-systems of the river. 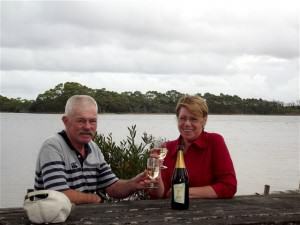 By now it was time for our lunch, supplied as part of the cruise, and we enjoyed a fantastic meal from the buffet while the boat left the Gordon River and moved along toward Sarah Island. 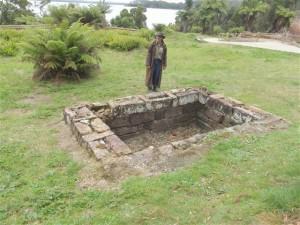 Sarah Island, Tasmania’s oldest convict settlement, was supposed to be the worst of its kind in colonial Tasmania. This settlement operated between 1822 and 1833 and was established long before Port Arthur with secondary offenders generally finding themselves among those sent here. During this time almost 2000 prisoners, officials, and military passed through. It might have gained a reputation as the worst penal settlement but it also was renowned as the site of Australia’s largest shipbuilding yard with labour supplied, of course, by the convicts. in a little role playing, and had a whole lot of fun! Having people from the tour actually playing the parts brought the characters to life for us and, of course, made it much more fun. Kiah was extremely knowledgeable and she told the story in such a way that we remembered it easily. How I wish I’d had a history teacher like her! The cruise was almost over and it wasn’t long before we docked back in Strahan. The weather was still unfriendly and the best place to be now was definitely indoors so we made our way back to the cabin to start packing up. Two short days in Strahan is certainly not nearly enough and I hope it won’t be too long before we come back – and next time the West Coast Wilderness Railway is definitely on the list! The information contained in this journal is derived from our personal recollections of our visit to this town or region and is correct as at the time of publication. austracks accepts no responsibility should any of this information be incorrect or misleading due to changes, improvements, or upgrades that may have occurred to places and/or attractions since our visit. © 2019 Austracks. All Rights Reserved.